Stan Leonard has won more PGA Championship’s of Canada than anyone else—from 1940 to 1961 he won the championship an astonishing eight times. He was a three-time winner on the PGA Tour—1957 Greater Greensboro Open, 1958 Tournament of Champions and 1960 Western Open—as well as a top-10 finisher at The Masters four times. Leonard also won three PGA Seniors’ Championship’s of Canada. 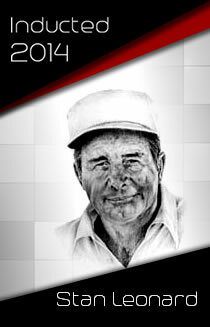 Stan was inducted into the Canadian Golf Hall of Fame in 1972.